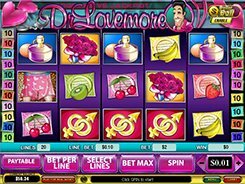 Experience true love with the 5-reel 15-payline True Love slot released by Playtech. The slot symbols are all about love: rings, the Cupid, violins, ladies and candies. The slot machine is fitted with a Stop Spin Feature enabling you to stop the spinning reels any time you want by pushing the Stop button. So, you will gain full control over your fortune. You can bet a maximum of 10 coins setting up a coin value from $0.01 to $5. As you might expect, a wild symbol is represented by the Cupid that has the power to substitute for other icons. In addition, a wild symbol multiples your wins x2 times your bet per line. 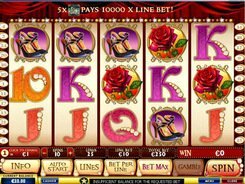 Five Cupids landed on any active payline is the most alluring combination paying out a jackpot of 10,000 coins. The girl icon is a scatter that grants you 15 free games with a x3 multiplier, provided at least three scatters have dropped anywhere on the reels. A scatter is a paying symbol giving you a win of up to x500 your total stake. The Gamble feature is an optional round that can be activated after each winning spin. Be aware that this is a ‘Win or Lose’ feature with a 50% chance either to double up or lose your winnings earned in the current spin. In the Gamble round, you’ll pick one of four cards. If the card of your choice is higher than the dealer’s card, you are a lucky winner. PLAY FOR REAL MONEY!